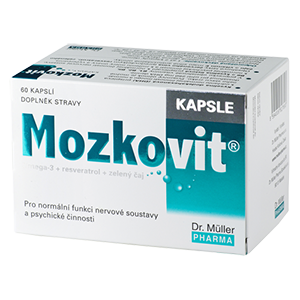 This product helps to retain normal function of the nervous system and mental activity. Docosahexaenoic acid (DHA) contributes to maintenance of normal brain function and normal vision. It can manifest its benefi cial effect if 250 mg DHA are used daily. The product contains vitamins B1, B2, B5, B6, and folic acid that contribute to normal functioning of the nervous system, normal psychological function, and to the reduction of tiredness and fatigue. Vitamin E and substances inherent to red wine (especially resveratrol) and green tea have strong antioxidant effects.